Fun Stuff to do With Your Dog – Good Times. Hi there and welcome, In this post, I’m going to share some ideas with you, on fun stuff to do with your dog. I will only get to cover a few ideas as there are so many things you, can do. It’s all about fun so here we go. A beach is a place so many people love to take their dogs. Lots of space to play, a great pleasure to have fun especially if your dog likes the water and if they don’t it’s a really cool place to go for a walk. Some fun stuff to do with your dog at the beach could be throwing a stick, playing ball, going fishing, doing some beachcombing or maybe even going for a run. If you are going to take your dog to the beach remember it is a public place and you, may come across people on the beach who are wary of dogs. They may have children and become nervous if they see your dog bounding along the sand, so please be considerate of other people and if necessary have your dog on a leash until you are far enough away from the public. Summer is always a time when the beach is highly populated and in some towns, there are times when you, are not allowed to take your dog onto the beach where people gather to swim and picnic, so check the rules. Also, if your dog loves water, be aware if you are throwing a stick into the sea, sometimes predators for example sharks can come in very close to the shore especially if the water is warm and when it gets close to sunset. They have no mercy when it comes to dogs and can smell them from a long distance. Not a great subject to share, however, I have heard some grim stories over the years. I live by the seaside and I have had so much fun with my two girls there. I have also seen a lot of people with their dogs having heaps of fun. Again be considerate of the public who may be out walking and keep your dog on a leash for this walk. Take a poop collector and if you, come across other people out walking their dogs always be aware of the attitude of the dog you, about to pass. You want to keep yourself and your dog safe at all times. Have fun with your dog and be responsible as an owner as I’m sure you, will. Some breeds of dogs, in particular, the Border Collie absolutely love agility. Border Collie dogs are highly intelligent, have a high energy level and love to learn. There are many other breeds that enjoy this as well. You can buy your own agility course and set it up on your property if you, have space or you, could take your dog to agility classes and let an experienced trainer work with your dog to learn the skills needed. Agility products can be purchased either from a store you know of locally or online. Here are a few agility products you, might like to check out. 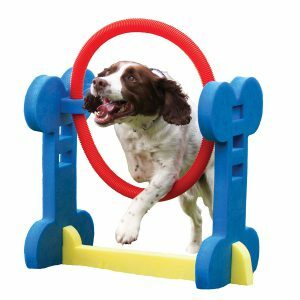 5-star reviews for this product Competitive Agility course enhancing the bond between you, and you, dog. 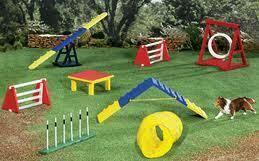 High jump, weave poles, square pause box, round open tunnel keeping your dog really interested during training. Easy to set up and it has bags for easy storage. There are 100’s of toys that you, can buy and lots of fun stuff to do with your dogs and hours of fun ahead for you, both. I wish you, lots of fun, laughter and happy memories on your fun journey with your, dog/dogs. If you, enjoyed this post please leave a comment or ask any questions you, may have and I will get right back to you.